"Small, cramped and basic they may be, but these apartments have the brilliant advantage of an awesome location on the side of a piste for the ultimate doorstep skiing experience. 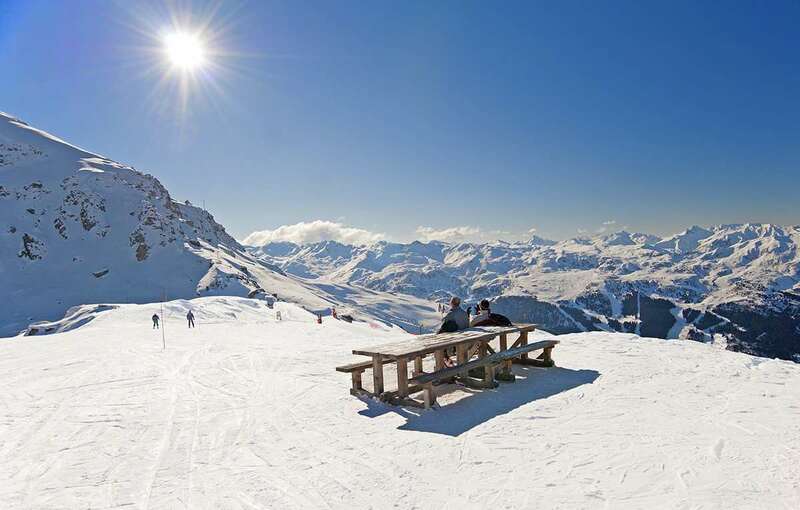 For après ski, there is a regular bus between Meribel and Meribel-Motterat. A top option for skiers and boarders on a budget." The Hameau du Mottaret Apartments are good-value accommodation within the Hameau du Mottaret complex. Just a short gondola ride up from the resort centre, the complex is home to a range of shops and restaurants, as well as its own shopping centre, a bar with live music, a children’s club and even a fitness centre. The apartments themselves are nestled inside one of the dark-wood chalet-style buildings, and come in different shapes and sizes, with the largest sleeping up to six people. They’re simple yet comfortable, and come with a living area, while others also have separate bedrooms. If you stay at the apartments, you’ll have free use of the Chalets gondola that takes you down into the centre of Méribel-Mottaret. Here you’ll find a variety of lifts that’ll link you to the world-famous Three Valleys ski area, as well as shops, restaurants and bars (great for when you can’t be bothered to cook). If carrying your equipment over to the gondola seems too much hard work, then you’ll be glad to know that the complex is next to the piste, so you can just click on your bindings and head straight down the hill – perfect. The apartments are located at a top of winding road, quite a distance from the centre of Méribel-Mottaret. To save you the long walk down to the town, you can catch the Chalets gondola next to the complex. At the bottom you can pick from a selection of lifts – the Pas du Lac can take you towards Courchevel, while the Platieres heads over in the direction of Val Thorens. You can also head further down the mountain to Méribel by taking the Truite blue run. All apartments have a kitchenette with hot plates, oven, fridge and dishwasher, shower rooms in Type B and bathrooms with separate WCs in all other types. Bed linen and local taxes included. Towels not included. TVs are available at an extra charge. WiFi payable locally. Type B studio (18m²) - sleeps 1-3: Living area with a double pull out bed. Alcove with a single bed. Type C studio (27m²) - sleeps 1-4: Large living area with a solid sliding partition, forming 2 separate sleeping areas with 2 single beds in each and balcony. Type D apartment (33m²) - sleeps 1-5: Living area with a double pull out bed and a single bed. Bedroom with either 2 single beds or bunk beds. Type E apartment (40m²) - sleeps 1-6: Living area with 2 sofa beds. Twin bedroom. Open mezzanine with bunk beds. Additional shower room with WC. Type F apartment (43m²) - sleeps 1-7: Living area with 2 sofa beds. Bedroom with twin beds or bunk beds. Bedroom with bunk beds and one single bed. Additional shower room with WC. Extra charge for Weekly beds/cleaning upgrade includes beds made up on arrival, midweek cleaning service (except kitchen area) towel change every 2 days and end of stay clean (except kitchen area).